It can be tricky choosing the right dog brush. Let expert Wendy Nan Rees help you with some tips on making the right choice. You'll be grooming like a pro in no time. In this week's tip, I would like to talk about how to pick the right brush for your dog. I know we have talked about shedding and grooming, but I think it is important to talk about the different types of brushes out in the market place, what they can do, how they are made and how to pick the right one for your type of dog. With so many breeds to pick from, you can imagine why having the right brush becomes important. You would not use the same brush on a Labrador Retriever that you would on a Yorkshire Terrier since their coats are different and have different grooming needs. First, you need to know your dog's coat type. Once you know that, my list here should give you a head start on choosing the right brush or comb. Long hair that moves (like on an Afghan Hound, Yorkshire Terrier or Irish Setter): The best type of brush for this type of dog is a steel-pin brush, a wire slicker and a good steel comb to finish off the job. A very short, slick coat (like on a Boxer, Doberman or American Staffordshire): A good, all-natural bristle brush can be used here. A rubber curry brush is a good choice, and you can find one at any pet store. I like to use the ones found at horse supply stores. They are less expensive, and some of them have a special end to attach a hose through. This is wonderful for any short-coated breed when bathing. That is something I encourage all of you to use; it is great. Another wonderful tool for the short and slick coat is a rubber grooming mitt and a good steel comb. A curly coat (like on the Chesapeake Bay and Curly-coated Retriever, the Poodle and also a few of the new mixed breeds like the Labradoodle): These dogs may not shed as much as other breeds, but at the same time they are a bit harder to brush, so try a curved, fine wire slicker brush on these type of coats. A medium length, wavy fur with a double or single coat (like on the Labrador Retriever, Golden Retriever and German Shepherd): A good shedding tool, a good steel comb and a wire slicker will all work well with this type of fur. 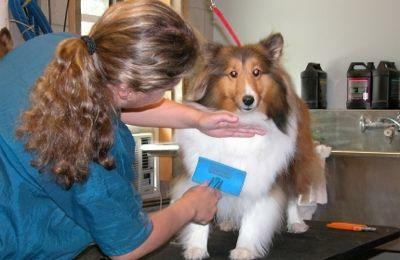 All dogs need to have a flea comb, and if your dog sheds then it is imperative to own a good shedding tool. If you look back to one of my older tips you will read about my personal favorite shedding tool, the FURminator®. There are many other shedding tools on the market, this is just my personal favorite. It is important to understand why you should perform daily brushings. You want to brush daily to help loosen all the old hair and dander from your dog. Believe it or not, brushing daily will help lubricate your dog's skin with his own natural oils. When shedding season comes along, you will have far less fur on your floor and furniture if you carry out daily brushing. Most of all, you will also bond with your dog. You and your dog will come to love the ten minutes a day of brushing or combing. Look at this as a mini massage for your pet and a good work out for you. Please note, if your dog has a lot of mats, it may be best to see a professional groomer since the mats can hurt your dog, and they can be very hard to remove. This is another great reason to give your dog a brush a day to help keep the mats away! !